Chrome extensions are a way of enhancing a users behavior, by extending the Google Chrome browser. You can inject code into websites and add functionality to enhance a users experience with that site. In this tutorial we will create a simple chrome extension, from the enhancing variety. We will learn how to add a button on a wordpress.org plugin page, and use information from that page for our functionality. First of all we need to decide what to enhance. Wordpress.org has a plugin repository, and it allows you to download a zip archive of a plugin, for later uploading to your blog. This is sometimes uncomfortable, and they later introduced a way of installing plugins right from the admin panel of your blog. However, every time I’ve Googled for a specific plugin, I’ve ended up copying it’s name from wordpress.org, login to my admin panel and search that plugin from there. Our extension can help us automate this proccess. 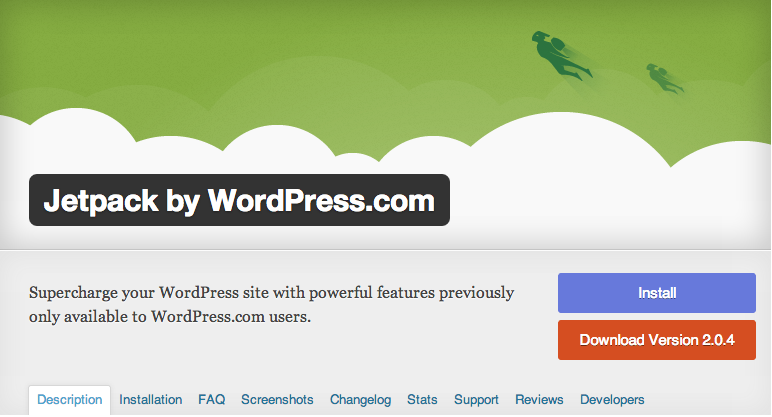 We will learn how to add a quick “Install” button for plugins on WordPress.org page. Clicking that button will ask the user to enter his blog url, and then open a popup with the install page for that plugin. 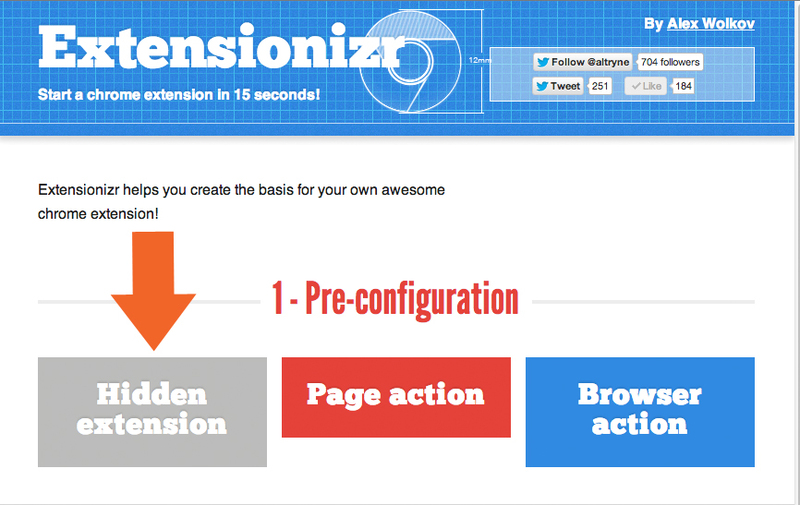 Chrome extensions are structured exactly like a regular website, with 1 exception. As this can get tedious, I’ve automated this process a bit with extensionizr.com. Go to http://extensionizr.com, and select “Hidden”. Our extension won’t have any views, it will only enhance the wordpress site. Next check “No background”, as we don’t need a background process for our extension. Check both inject.css and inject.js. Those are the files that will be injected into the url we choose (wordpress.org/extend/plugins) every time a user visits them, and will run in the page’s context. *One thing to note, an extension won’t have access to scripts already running on that page, according to Chrome’s security policy. Click “Download it!”, and you should receive a zip file with a basic structure of a chrome extension and a manifest.json file in place. Edit the manifest.json file, and specify the url our scripts will execute in. Next we need to find out where we in the page want to inject our button. I figured the best place for it was above the “download” button that’s already on the page. Wordpress.org marks the download button elements with a[itemprop=”downloadUrl”]. In inject.js we add the following code to query the download button by the itemprop attribute. Now that we have our download button element, we can extract the plugin name from it’s href attribute. Because all of wordpress plugin urls are similarly structured, we can extract the plugin name from the url with ease. Next we prepare the element to be inserted and add a click event handler to it, then insert it near the previously found download button. We need to add code to handle the clicks on the install button so we can open the users blog admin panel with this plugins install page. so the user won’t have to enter the same url over and over next time. Our button will already receive the same style as the download button, but we want to make it look different. And that’s it, now all we have to do is test out our extension. In chrome, navigate to about:extensions, and enable the “developer mode”. While you develop a chrome extension, you have the option of loading a directory on your computer, work on files, and chrome will address that directory as the extensions code. This means you can change your code, reload the extension and see the changes immediately. When you want to send your extension to someone, chrome will pack it in a CRX file, which is a special archive for installing extensions. We click on “Load unpacked extension”, and choose our directory and Viola. And add an “install” button that will prompt him to enter his blogs URL, and then conveniently open an install page for that specific plugin.